Most agree that achieving a bright, white smile can provide a great boost to patients’ confidence. advancements in dental technology have taken professional teeth whitening systems and made it more convenient to attain the desired results. For over 30 years, Dr. Murray P. Holdurn of Millidge Place Dental Clinic offers professional teeth whitening in Saint John for patients wanting to address their smile’s aesthetics. If you are interested in any of our cosmetic services, contact our office today to schedule an appointment. Normal wear and tear, tobacco use, or consuming beverages such as coffee, wine, and soda are several factors leading to tooth discoloration. Other stain-causing factors include taking certain medications and aging. 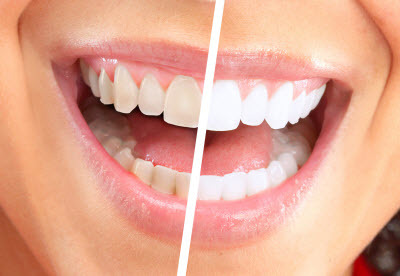 Some choose to whiten their teeth to look their best at a social event or important job interview, while other patients hope to look younger or reverse years of discoloration. Millidge Place Dental Clinic develops fully customized teeth whitening strategies to deliver stunning and successful results with every visit. Dr. Holdurn strives to provide effective whitening treatments for our St. John patients. By staying up-to-date with the latest advancements in the industry, we ensure personal and attentive care. We do everything we can to provide you the radiant results. Helping you establish a strong at-home oral hygiene routine is a top priority for our team at Millidge Place Dental Care. We discuss beneficial techniques and healthy practices that aid in achieving the brightest smile possible. Once Dr. Holdurn has determined if teeth whitening is the ideal option, we offer both take-home and in-office whitening treatment so patients can make cosmetic improvements conveniently. Our chairside option can be performed in one visit depending on the severity of discoloration. Dr. Holdurn gently applies a protective gel to your teeth before the bleaching mixture is activated to help combat sensitivity. This treatment is ideal for those wanting more immediate improvement, as the procedure generally lasts an hour and provides instant results. Additionally, our take-home whitening utilizes custom trays to ensure comfort and allow patients to whiten teeth at their own convenience. Contact Us for Your Whitening Appointment Today! When you are hoping to improve your dental aesthetics, Dr. Holdurn, and our dedicated team at Millidge Place Dental Clinic offers teeth whitening in both chairside and take-home treatments. For more information on how our exceptional teeth whitening systems can benefit you, call or visit our Saint John Practice today!